My friend Jeanine is the talented gluten-free blogger behind The Baking Beauties blog. Her blog is full of delicious desserts, yummy baked goods and family meals. Jeanine had her first book published earlier this year, The Everything Guide to Living Gluten-Free . I received a preview copy of this book to review and just loved it. At the end of this post, you can enter to win your own copy of this great book! The beginning of the book includes several chapters that cover everything you need to know about gluten, celiac disease, and getting started on a gluten-free diet. So many facts and tips are mixed in these chapters as well. Tips on what to clean and what to replace in your kitchen once you go gluten-free. I wish I’d had this list when I first started! Are your children gluten-free too? This book has a lot of tips for schools and parties that I thought were really helpful. Over 100 recipes for breakfast, kid-friendly lunches & snacks, main dishes, sides & salads, breads, slow cookers, desserts, and arts & crafts recipes. 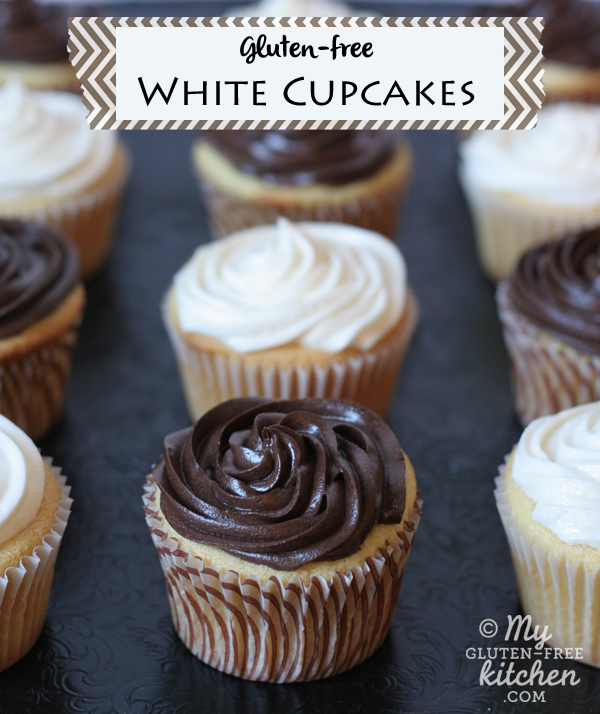 Everyone needs a good standby recipe for white cupcakes. As of yet, I didn’t have a go-to recipe for these. When I was flipping through this book, the recipe for White Cake caught my eye and I decided to follow the recipe and then make as cupcakes instead of a sheet cake. They were delicious! The recipe made 24 cupcakes. I frosted 12 with my favorite fudge frosting and half with my favorite white icing (will post soon!) 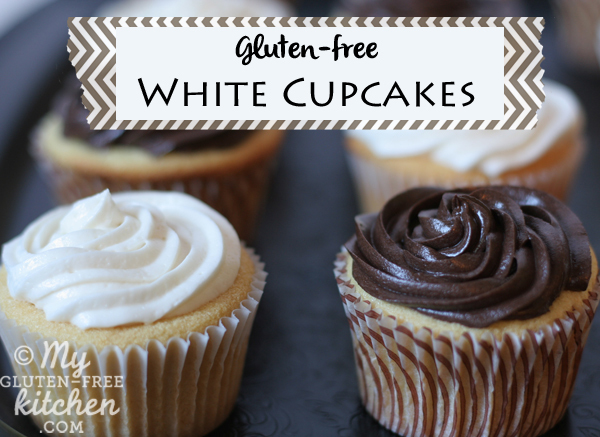 Both frostings went well with these white cupcakes. I served them to two families that joined us for birthday dessert over the weekend, and everyone thought they were really good. Make sure you enter to win your own copy, or go order a copy of The Everything Guide to Living Gluten-Free for yourself! You’ll find so many yummy recipes like this one! And here’s the recipe for these delicious cupcakes! Preheat oven to 350°. Spray a 9" x 13" pan with nonstick cooking spray and set aside. For cupcakes, line 2 muffin pans with paper liners (24 cupcakes total). In a large bowl, combine with rice flour, millet flour, tapioca starch, xanthan gum, sugar, baking powder, baking soda, and salt and mix well with a wire whisk. In a stand mixer fitted with a paddle attachment, beat the butter until fluffy. Add the flour mixture, along with the milk and vanilla. Beat until blended, and then beat on medium speed for 2 minutes. Add the unbeaten egg whites, all at once, and beat 2 minutes longer. Pour batter into prepared pan for sheet cake. For cupcakes, use a large cookie scoop or ice cream scoop or measuring cup to fill cupcake liners 3/4 full, making 24 cupcakes. Bake at 350° for 35-40 minutes, or until cake is beginning to pull away from edges and is light golden brown. For cupcakes, bake for 15-16 minutes or until the cupcakes are a light golden brown. Allow sheet cake to cool completely on wire rack. Allow cupcakes to cool in pan about 5 minutes, then gently remove to a wire rack to cool. Recipe from The Everything Guide to Living Gluten-Free by Jeanine Friesen. Copyright ©2013 by F+W Media, Inc. Used with permission. As always these look amazing. You have me seriously considering going gluten free to see how I feel and find out if it would help with my thyroid issues. Thanks for so many delicious recipes! I like vanilla and chocolate, but I like to try different flavours. I think banana would have to be my favourite. These cupcakes look soooo good! Im terrible at baking them from scratch and a book to help me would probably do the trick! I love the standard chocolate but red velvet are second. I really like chocolate cupcakes, or lemon cupcakes…miss those. My favorite cupcake is vanilla with chocolate icing!! I hubby just found out he has celiac disease….With further testing to be sure that’s the issue and talking to a dietitian we will then go gluten free for the most part…..I will probably follow the same diet with my husband and probably try and switch my son gradually too. I would love to have this cookbook!! Her recipes always look so good! My favorite flavor is chocolate! My favourite cupcake flavour is white chocolate and raspberry, i find this flavour combination amazing! I enjoy cupcakes. Since having to go gluten free I have been searching for a cupcake recipe. Looking forward to trying this one. Thank you for posting this recipe. these cupcakes look really tasty! I haven’t made any gluten-free cupcakes yet. I would love to win this book! If these are anything like your chocolate ones, they will be fabulous! Linda, I can’t remember if mine sunk in slightly when I made them or not, since it has been so long. I think they came out pretty flat. Usually if they sink much I would think that they maybe needed just another minute or so longer of baking. Hope they tasted great and you could just cover it up with a little extra frosting! I love that frosting!